The citron is a large fragrant citrus fruit with a thick rind. It is found in Italy and Corsica. Cut the citrons into quarters then remove the seeds and the pulp to keep only the skin. Cut them into long sticks. Blanch them for 10 minutes, then drain. Weigh them, then prepare a syrup with water and the same weight of sugar. Dip the citrons in the syrup and let them simmer for 20 minutes. Remove the citrons, and let the syrup reduce for another 10 minutes over low heat. Once the syrup has cooled, place the citrons in overnight. The next day, cook again for 20 minutes the citrons in the syrup, drain, then repeat the same operation 2 days in a row. Sprinkle the citrons with the remaining syrup and let them dry. 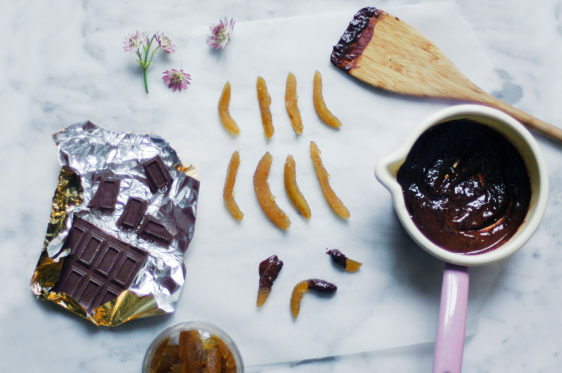 Melt some dark chocolate and dip them in (half or full).